*Did you know that the Sundre Arts Centre is managed and maintained entirely by volunteers? All of our concert prices and rental rates are calculated to break even – providing the community with an affordable venue and great entertainment! We rely on fundraisers and grant money to help us with large maintenance items and equipment repairs. So if you’re not up to anything next Saturday evening, come on out! *Update (8 Feb): 45% Sold -- TICKETS WILL ALSO BE AVAILABLE AT THE DOOR! See you tonight!! 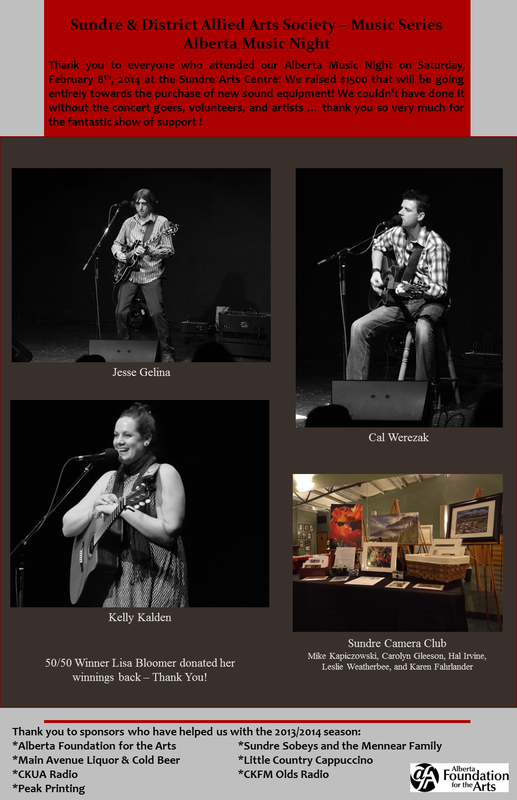 We are pleased to have 3 talented musicians coming to perform at the Alberta Music Night - Cal Werezak, Jesse Gelina, and Kelly (Tschritter) Kalden will be performing for concert goers! 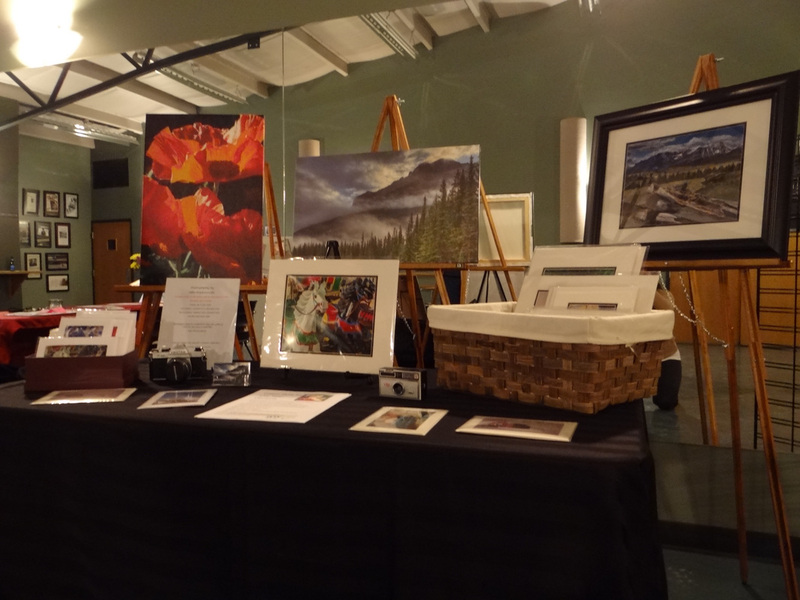 The Sundre Camera Club will also be bringing a selection of images for display during the evening! The event on Saturday, February 8th, 2014 will showcase the incredible talent that resides in Central Alberta! Ticket sales from the evening will be going towards the purchase of sound equipment for the Arts Centre. We will also be having a 50/50 raffle and will gladly issue tax receipts for any donations received at the concert. Please come out and support the arts in your community! 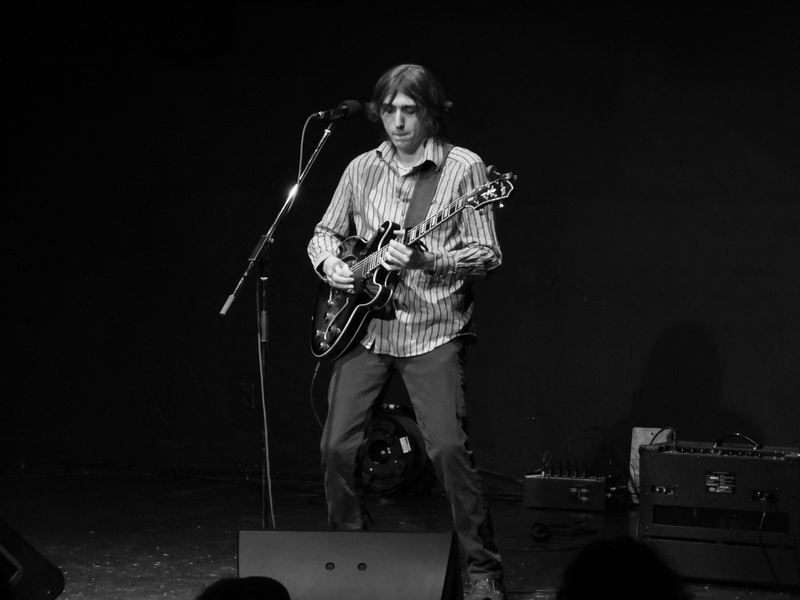 JESSE GELINA: Jesse has been playing guitar now for ten years. He considers himself a songwriter first and a musician second. He is inspired mostly by modern progressive rock, though draws influences from plenty of other genres as well. For the most part, he’s completely self-taught and knows next to nothing about music theory. His lyrics are usually heavily abstract in nature and written in such a way that everyone can interpret them differently. All the songs he will be playing fall under the umbrella of his music project called Bloomvine. SUNDRE CAMERA CLUB: This will be the club’s second year joining us and last year’s display demonstrated interesting compositions of artistry, technique, and talent - we’re sure this year’s display will be even better! Please visit the Sundre Camera Club's Facebook and Flickr pages to preview some of their work!